Catalogue for an Internationale Situationniste exhibition held at the Galerie EXI in Odense, Denmark, 22 June-7 July 1963. “The name of the exhibition is an homage to Spies for Peace’s Official Secret – RSG6 action, in which the anti-war activist group revealed that, in the event of a nuclear attack, the British government had conceived a plan to house key central government personnel in a secret bunker known as Regional Seat of Government number 6 (RSG-6). The intent was to insure continuity of law and order in the event of a nuclear holocaust. The information was published in the Danger! 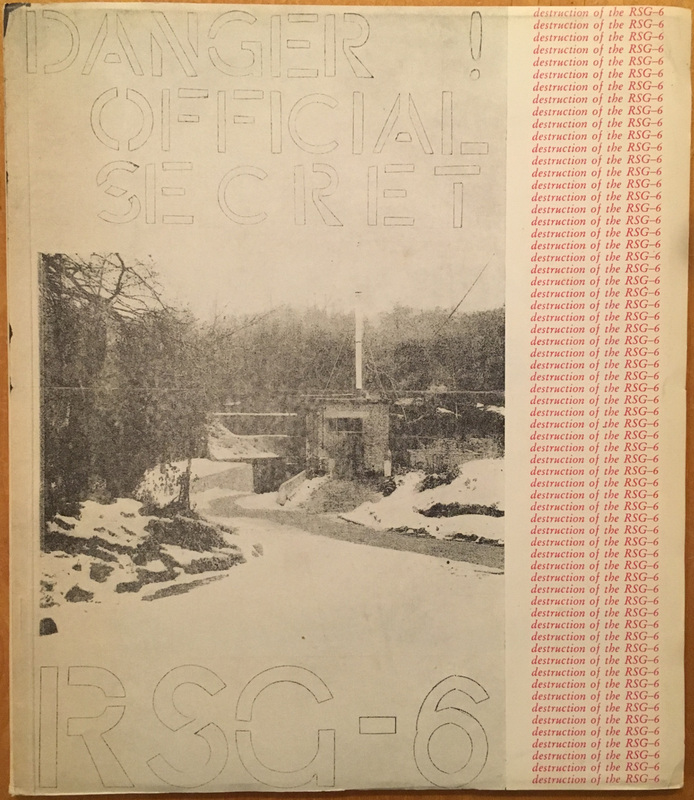 Official Secret RSG-6 pamphlet, of which 4,000 copies were produced, then mailed to key officials and distributed on the streets. The catalogue includes photographic portraits of Guy Debord, Michele Bernstein, J.V Martin and Jan Strijbosch, as well as reproduction of original artwork by these members of the S.I. It also serves as the first edition of Guy Debord’s important text ‘Les Situationnistes ou les nouvelles formes d’action dans la politique ou l’art’, published in the original French as well as in Danish and English translations. Featured pieces – all the result of some form of detournement – include Debord’s “Directives”, Bernstein’s “Victories”, and J.V. Martin’s “Thermonuclear maps” (paintings representing various regions of the globe during World War III), among others. All the artwork is shown in a gallery setting that invokes a post-nuclear world – one area, for instance, was a reconstruction of an oppressive nuclear bomb shelter. Exhibition review: Else Steen Hansen (Swedish, 1963). Commentary: Frances Stracey (2006), Mikkel Bolt Rasmussen (2011).